Lanzarote delivered on its promises of strong wind today, with the six RC44 teams battling to master the gusty conditions while also trying to win their five flights of intense match racing. The only boat to keep a clean sheet was Igor Lah’s Team Ceeref, helmed by James Spithill. Lanzarote, December 10 2008 – When the wind is gusting up to 25 knots, with some big shifts thrown in for good measure, sometimes winning in the RC44 fleet is a matter of keeping the wheels on the wagon. So it didn’t look too good for Team Ceeref when, on the first beat of the first race, the hydraulic ram on their forestay broke. This immediately led to the jib being shredded to within a few yarns of its life. They were lucky it didn’t disintegrate altogether. 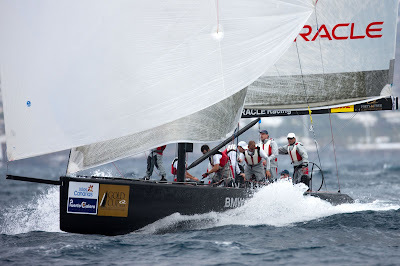 At this point James Spithill was still leading the match from his colleagues on board BMW ORACLE Racing, but with Larry Ellison rapidly closing in on the wounded Croatian boat. Thanks to some “creative trimming”, as Spithill put it, they managed to get to the top mark just ahead of the American boat without the jib breaking completely. It was neck and neck on the fast downwind leg but Igor Lah’s team rounded the leeward mark first. They extended to win quite comfortably when the American boat broached a few hundred metres before the finish line. 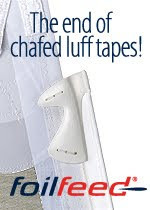 Having survived that early scare, Team Ceeref sailed a near faultless day, looking solid in the pre-start and going on to win all five matches in some challenging conditions, with the north-easterly wind shifting hither and thither off the mountainous coast of Lanzarote. Not a bad outing for Spithill who, after many weeks of high-speed training on BMW ORACLE’s giant multihull, admitted to being “a little rusty. Team Aqua lost their last match of the day against Ceeref, but apart from that it was an excellent set of races for Chris Bake’s team from United Arab Emirates. Kiwi helmsman Cameron Appleton sailed some aggressive pre-starts and made them work well for the team. He also took maximum advantage of his rivals’ errors. In the match against Banco Espirito Santo from Portugal, Team Aqua was leading round the final turning mark but had problems setting their spinnaker. Mark Mendelblatt looked set to surf the Portuguese boat into the lead when they suffered their own spinnaker problems through a messy gybe. Appleton was off the hook, and regained the advantage to seal victory. 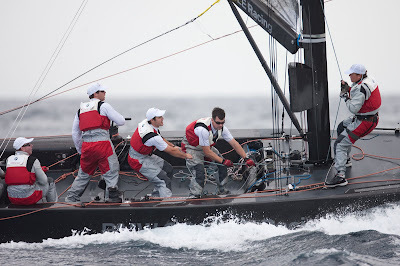 Islas Canarias Puerto Calero are the new kids on the block in the RC44 class. This was their fourth day sailing the boat, and what a tough way to start their campaign - against the world’s best match racers in some of the toughest conditions. Gear breakage and unfamiliarity with equipment proved their undoing, but against Aqua they led all the way round the race course. However on the final run to the finish, Chris Bake’s team were the first to spot the big left-hand shift and they gybed almost as soon as they rounded the windward mark. José Maria Ponce found himself stranded on the outside of the new breeze and had to flog the spinnaker to get across the finish line. An opportunity missed, but he and the rest of Daniel Calero’s crew are fast learners. Perhaps tomorrow they will get their first victory in the RC44 fleet. Larry Ellison was steering a brand new boat, and so was suffering the inevitable teething problems. However, the Americans looked stronger as the day went on and in the final match against Artemis they managed to beat Dean Barker, moving BMW ORACLE Racing into third overall with a 3:2 scoreline, and relegating the Swedish team to fourth overall with 2:3. Today was windy. Tomorrow is expected to be windier. Another day where it will be all about keeping the wheels on the wagon. The match racing event concludes tomorrow, followed by three days of fleet racing.